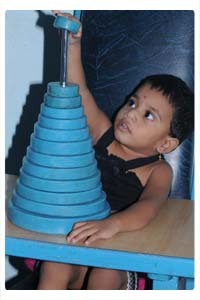 Occupational Therapy is a health discipline that evaluates, treats and consults with individuals to restore, reinforce and enhance the capabilities of individuals to cope with the tasks of everyday living that is threatened or impaired by physical and psychosocial illness, injury or disability and developmental delay. What is the goal of Occupational Therapy? The goal of Occupational Therapy is to enable people to participate independently and successfully in activities of daily living, work and leisure by increasing functional abilities thereby, enhance the quality of life. Where does Occupational Therapists work? In pediatrics what are the diseases being treated here? How do the Occupational Therapists work? Occupational Therapists work with the child along with the parents and care givers to assess if the child has difficulties with the practical and social skills. Occupational Therapists assess the physical, psychological and social functions of the individual in identifying areas of dysfunction and involve the individual in a structured program to overcome disability. A therapist may work with an individual or in small groups in the classroom and consult with teacher to improve functioning skills of the child. Therapy is provided when there is a disruption of function in the following areas. 8) Socio-emotional skills:- Ability to interact with peers & others i.e. The core value of Occupational Therapy is family-centered care & service. The needs, desires and values of child & family drive the direction towards assesments & intervention.